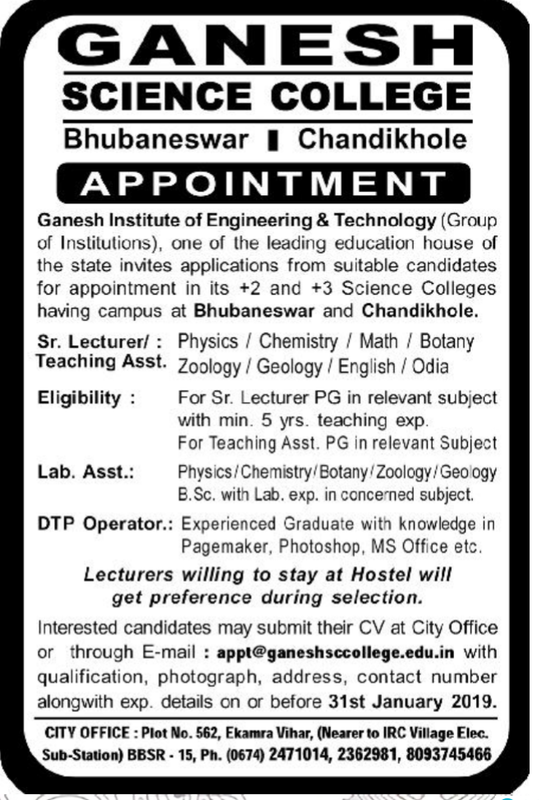 Chandikhole,Odisha has advertised for the recruitment of Teaching Faculty- Sr.Lecrurer,Lecturer,Technical Assist jobs vacancies. Interested and eligible job aspirants are requested to apply with in 31.1.2019. Check out further more details below. 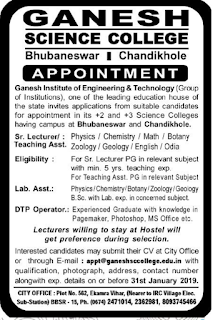 Name of the College: Ganesh Science College, Bhubaneswar,Chandikhole,Odisha. About College: TheGANESH INSTITUTE OF ENGINEERING AND TECHNOLOGY (GIET) is one of the leading Institutes in the field of Technical education. It has been established in 1990 by a group of Engineers.It is running under the Alakananda Philanthropic Trust. The institute is also supported by some leading industrial houses & eminent personalities to guide the management to match with the requirements of the Industries & cope up with the present needs. For senior lecturer PG in relevant subject with min 5 years teaching experience. For teaching Asst PG in relevant subjects. Lecturer willing to stay at hostel will get preference during selection. How to Apply: Interested and Eligible candidates may submit their CV at office or through email,with qualifications photographs,address,contact,telephone number along with exp.details within 31.01.2019.